Smoothies are refreshing and delicious. But, unfortunately, most smoothies are made to be ultra fattening, and could be slowing down or even reversing your fitness results. Smoothies are refreshing and delicious. But, unfortunately, most smoothies are made to be ultra fattening, and could be slowing down or even reversing your fitness results. If the thought of having a smoothie derail your health train is upsetting, read on to find out whether your smoothie is working against instead of for you. Does It Have Fruit Juice? 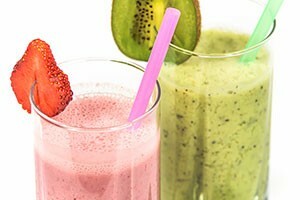 If your smoothie relies on fruit juices to give it some added punch, your smoothie may not be as healthy as you think. Since fruit juice is often jam-packed with flavor-enhancing sugars, you’d be smart to keep fruit juice well away from your morning pick-me-up. Have a killer recipe that can’t do without fruit juice of some sort? No problem. Just be sure to pick all-natural homemade squeezed fruit juice or coconut water. The best way to make sure your fruit juice is nothing but fruit juice is to squeeze it yourself, so start squeezing! Do You Have to Add Sugar? For the same reason you don’t want a smoothie with store-bought sugar-laden fruit juice, you want to sidestep any smoothie that requires you to toss extra teaspoons of sugar in. The fruit you add to your smoothie should have plenty of sugar to give it the sweetness you desire. Anything else is excessive and will serve to slow you down and encourage fat storage. Do You Toss in Yogurt? Smoothies that include yogurt can come out on the healthy or unhealthy side of things. It all depends on what kind of yogurt you use. If your favorite type of yogurt is stuffed with added sugars and flavors, it’s not going to be a good way to power yourself up for the day. On the other hand, if you’re careful to only use homemade, organic, or Greek yogurt, your smoothie can be a superbly healthy start to your day. Is It Super Sized? No matter what healthy ingredients you shove into your smoothie, it can still sabotage your weight and health goals if you can’t stop eating it. Before you serve yourself a 48-ounce smoothie, consider your weight goals and split your morning smoothie into appropriate portions. Drink down one portion in the morning and save the rest for a small afternoon snack or finish it off the next morning. Either way, avoiding an oversized smoothie will keep your smoothie from ruining your diet. Do You Ever Color It Green? While fruit smoothies are incredibly delicious, it’s a great idea to switch it up by making a veggie smoothie on occasion. You may even want to go green the majority of the time. The deep green color is sure to give you some vitamins and minerals that your body is likely missing, and skipping the fruit on occasion will remind your taste buds that good things don’t always have to be sweet. Does It Contain Ice Cream? Okay, this may sound like a joke, but if your smoothie contains three scoops of ice cream, a squirt of chocolate syrup, and a cup or two of milk, you’re not drinking a smoothie. It’s a milk shake. And it will not get your day or diet off on the right foot. Before you laugh too loudly, you should know that some people think that anything cold and creamy that comes out of blender is a smoothie. So if you’re lounging at a friend’s house and he or she offers you a delicious homemade smoothie, ask what’s in it before accepting! When it comes to fat loss, eating clean is half of the battle. The other half is all about effective, challenging and consistent exercise.